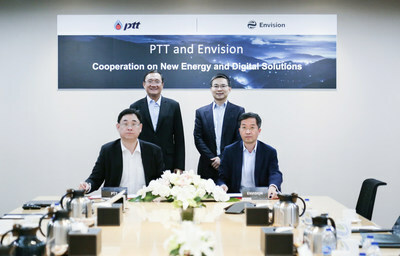 SHANGHAI, April 11, 2019 /PRNewswire/ -- On April 8th, 2019, Envision signed Memorandum of Understanding (MOU) with PTT Public Company Ltd to collaborate on multiple initiatives revolving around new energy and digital transformation. Headquartered in Bangkok, PTT is the largest conglomerate in Thailand, a fully integrated energy company which engages in oil and gas, coal, electricity, and infrastructure businesses. Mr. Lei Zhang, Founder & CEO of Envision Group said: "EnOSTM, the AIoT operating system, is the connector between the OT world and IT world. 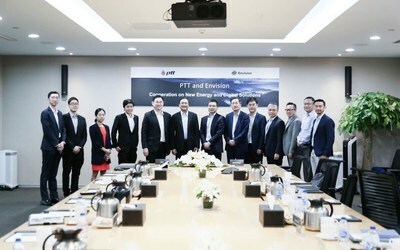 Based on EnOSTM, Envision is confident that we could support PTT to accelerate its digital transformation initiative especially in the new energy and electrification initiatives, thus improve the efficiency in exploring the business opportunities in new energy area." "PTT is always at the forefront of innovations and has now planned to increase its long-term investments in new businesses including venturing into the electricity value chain and clean energy business, and accelerating digital transformation. We also play a big part in Thailand 4.0 strategy by leading the smart city development in the Eastern Economic Corridor of Innovation (EECi). In this partnership with Envision, which is proven to be an ever-innovating digital energy company, we are very confident that our progress in these initiatives will be accelerated," mentioned Mr. Wittawat Svasti-Xuto, Chief Technology and Engineering Officer of PTT. Envision already has extensive experience helping enterprises in their digital transformation journey, from renewables to conventional industries to smart cities. "We believe both PTT and Envision have similar vision and values in new energy and digital transformation. With contemporary experience like Smart Nation DECADA project in Singapore, we are confident that we could add value to PTT's smart city initiative in Thailand," Zhang Lei added. While this exciting partnership is going to create mutual benefit to both firms, it carries a larger objective to provide cleaner energy and higher living standards to Thailand and the regional community. Envision is a leading digital energy company with deep industry expertise. It owns the world-leading AIoT Operating System, EnOS™, which currently manages 100 GW of energy assets globally. By integrating with technology partners such as Sonnen, ChargePoint, AutoGrid, and Bazefield, Envision is able to deliver a compressive energy IoT platform and smart city ecosystem. Founded in 2007, Envision's heritage is in the wind sector and is currently one of the industry's leading wind technology companies. Headquartered in Shanghai, Envision has regional offices across Asia, Europe, North and South Americas and has established global R&D and engineering centers in Singapore, Denmark, Germany, the United States and Japan. Envision's mission is to "solve the challenges for a sustainable future"; the company is committed to creating a world of beautiful energy where everyone has access to clean, secure and affordable energy. PTT Public Company Limited or "PTT", the largest conglomerate in Thailand, is a fully integrated energy company which engages from upstream to downstream petroleum, coal, electricity, and infrastructure businesses. PTT was listed in Thai stock market on October 1, 2001. As a Thai Premier Multinational Energy Company, PTT has now planned to increase its long-term investments in new businesses in the New S-Curve industries. The move is in response to the government's Thailand 4.0 policy, which seeks not only to develop existing S-Curve industries, but also build New S-Curve industries for the country.